Rush—the first great movie of the fall—hits theaters today, and it's by Ron Howard? The journeyman director has always been competent, but hardly impressive. With no particular distinctive qualities to distinguish him stylistically from any other filmmaker, Howard has had a difficult time earning the respect of critics, though this has been less of an issue when it comes to his peers or audiences. In years to come, Rush may prove to be the key work in understanding Howard's invisible style. Like many other directors who began as actors, Howard is attracted to movies which offer his cast some conspicuous opportunities to shine. Say what you will about his melodramas A Beautiful Mind, Ransom or Cocoon, they are well cast and feature shrewd performances. 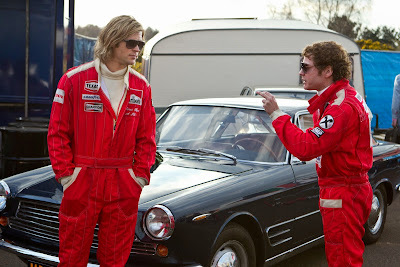 Despite its glamorous international racetrack setting, Rush is basically a two-hander not unlike Frost/Nixon. Though the primary backdrop is the racetrack, playwright Peter Morgan's script could easily be scaled down for a stage performance. Actors Chris Hemsworth and Daniel Brühl face off as Formula One race car drivers James Hunt and Niki Lauda, respectively. The two's rivalry hit its peak in 1976 when both would compete for dominance at multiple Grand Prix races under some startling conditions. As Rush takes pains to illustrate, Formula One is a deadly sport that claims the lives of about two drivers a year. The way the two competitors each deal with the pressure differs rather starkly. Freewheeling Briton Hunt drinks and debauches his way through the racing circuit while uptight Lauda carefully analyzes each element of the race—from the technical specs of his Ferrari to his own timing as a driver—in order to gradually shave seconds off his best race time. How each man responds to the personal conflicts that distract them off the track provide an entry point into their character and moments for both actors to capitalize on. Ostensibly the hero of the piece, Hunt is a nice fit for Hemsworth whose claim to fame so far has been the boastful god Thor in the Marvel film franchise. After bowing as the character about 2 years ago, I had compared him to Christopher Reeve. Perhaps I was foreseeing the difficulty the talented Hemsworth would face in breaking out of the superhero pigeonhole after bringing a flat comic book character to vivid life. For Hemsworth, Hunt is a perfect transition to more substantial roles, a braggart whose devil-may-care attitude ends up costing him a storybook marriage and potential sponsors before he learns to take things a bit more seriously from simply observing the rigid Lauda. Like with the disgraced former president in Frost/Nixon, Howard resists turning Lauda into a kind of villain. Indeed, he directs Brühl to a portrayal that nearly steals Rush away from Hemsworth. As it is, Lauda comes across as a worthy antagonist because he not only has Hunt figured out; he also knows himself. In one scene he takes all the vinegar out of Hunt calling him a rat by deconstructing the insult, eventually affirming that he in fact does possess rodent-like features. Brühl so inhabits the famed Austrian racer with the receding hairline and distinctive overbite that it was enough to cause me to forget the actor had also played the unforgettably boyish but twisted Nazi sniper Frederick Zoller in Inglourious Basterds. Past the indispensable performances, Rush's most immediate appeal is its beautiful appreciation for racing and the attendant international jet-set environs and its seventies-era backdrop. Anyone familiar with Howard's earlier films, Grand Theft Auto and Apollo 13, won't be surprised that he is a bit of a gearhead. Anthony Dod Mantle's camera finds its way into impossible nooks and crannies within the teeny-tiny Maclaren and Ferrari each racer drives. Inserts of engine parts, axles, and exhaust pipes rhythmically propel the movie towards its finish as fleetly as if one of the drivers were pushing on the throttle. Rush plays like a fan letter to Formula One racing as much as Steve McQueen's Le Mans does for endurance auto racing. And like the films just mentioned, there is a tinge of nostalgia for the 70s wafting in the gaps between the thrilling moments of Rush. The name-checking of actor Richard Burton (who Hunt's supermodel wife leaves him for), muted colors, and overcast skies that proliferated in movies of the period all evoke a time when danger and scandal simply gave a celebrity a bit of color rather than end his career. As he did with Apollo 13 and Frost/Nixon, Howard seems to perk up when he has all of these elements to build a movie on. They are as close to auteurial hallmarks as we may ever get from the director, and they all viscerally intersect in Rush. I would have much rather have watched GRAND PRIX again...a totally blah film, all across the board. Absolutely nothing in it interested me for one second, and I also thought the whole thing, from the clunky narration to the lack of any real story to the Eurotrash photography to the over-enthusiastic supporting players, and the totally dead-eyed leads, and that overly loud sound mix...and just...just everything about it was underwhelming, to say the least. We don't disagree often, but on this one, we're continents apart. Nice action scenes...that's right. I usually expect more from films than just action scenes or flat jokes. Sometimes when I read lots of delighted comments I feel I'm the only one demanding viewer (maybe demanding too much? )It's nice to see comments like yours.